For better or worse, Gifted Horse is one of the most interesting new American whiskey releases this year. The least expensive edition of the Orphan Barrel series to date cannot be called a bourbon because it is a mix of 38.5% 17-year-old Kentucky bourbon, 51% four-year-old Indiana bourbon, and 10.5% four-year-old corn whiskey also distilled in Indiana. In any event, the “accident” resulted in at least over 8,000 bottles (my bottle number was 8,328) which were released at a barrel-strength 118-proof. It sells for $50, although prices have been all over the place relative to suggested retail for the Orphan Barrel releases. The reddish gold whiskey features an astringent nose with red berries, roast corn, and vanilla. On the palate are strong woody flavors, cereal grains, burnt sugar, and tea notes. The finish is relatively short with charred wood. There’s a tannic sharpness to Gifted Horse that isn’t due to the proof but from the combination of old, quite possibly over-oaked, bourbon with younger whiskey. It’s disappointing because I had high hopes for Gifted Horse. Unlike previous Orphan Barrel releases, which could be fairly criticized for being underproofed, I was hoping this blend would offer fine flavors without being watered down. 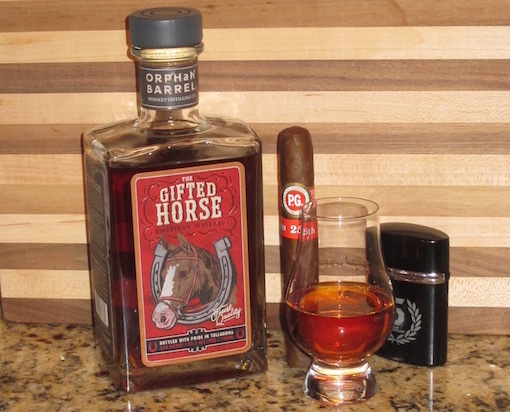 Despite Gifted Horse’s shortcomings, the full proof does offer some tasty cigar pairing options. It certainly can stand up to a full-bodied cigar like the PG 25th Anniversary Connoisseur (pictured, review coming soon), Coronado by La Flor, My Father El Hijo, and Arturo Fuente Opus X. Plenty of people have criticized the Orphan Barrel series as more marketing hype than good bourbon, but I’ve praised the previous offerings (some more than others) as an actual opportunity to buy ultra-aged bourbon at a reasonable price. Gifted Horse, however, is much tougher to recommend despite its friendlier price. Unless you’re more interested in trying an experiment than a fine whiskey, you’re better off spending more to find different Orphan Barrel offerings or any number of less expensive bourbons. With the burgeoning popularity of bourbon, it becomes a time of greater wariness especially where new bourbons are concerned. Even great old bourbons; for example, Elijah Craig is no longer a twelve-year old bourbon. They are blending it with younger barrels to keep up with demand. Will it be as good or even discernibly different? I have yet to perform a side by side comparison. Yes, beware of marketing hype. I was taken in by the marketing for Calumet Farm. Fifty bucks for a “special” bourbon that tasted like young rye and not a particularly complex one. Consequently, I will rarely purchase bourbon from outside of Kentucky or not made by the established distillers. Provenance means a lot in the bourbon world. Certainly agree with you that people have to be careful as there are lots of new overpriced bourbons out there that are designed to take advantage of the bourbon boom. If you see a fancy bottle with a name you don’t recognize, be very wary. Elijah Craig dropping the 12 yr age statement was inevitable as it was a tremendous value. You could see it coming when they pulled the 18 year off the shelves a few years ago and now have brought it back for more than double the price ($130). If history is any indication the non-age statement version will taste pretty similar to the 12 year version at first, but over time it will taste younger and younger. Fortunately there are still 12 year versions around (they say 12 on the back instead of the old label which had it on the front) so if you like it, you can stock up.